« Keefee’s House of Cards presents: Pussies! Help fulfill Nic Masangkay’s birthday wish – paying their DARK AT DUSK: The Final Suicide collaborators! 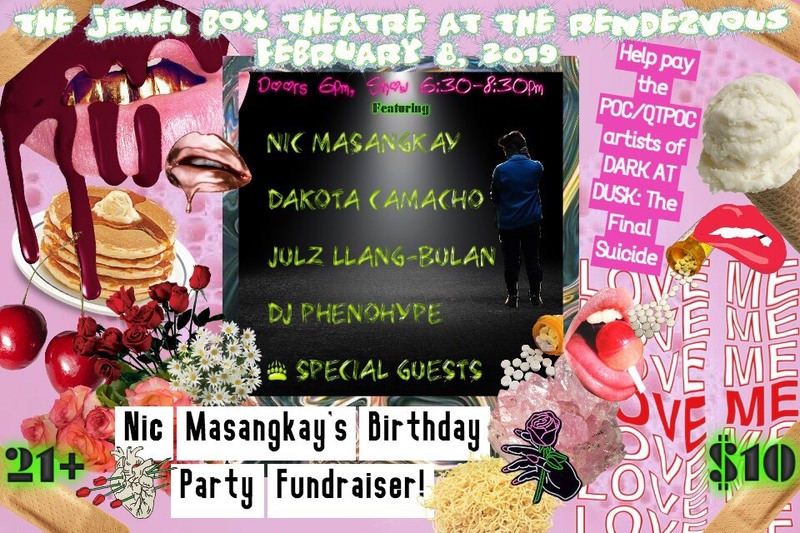 Performances by Nic Masangkay, Dakota Camacho, Julz Ilang-Bulan, and sets by DJ Phenohype! “Hello to family, friends, community, and generous people. It’s Nic Masangkay here, asking for only one major birthday wish this Aquarius season: your support in helping me compensate a special group of artists of color, most of whom are queer and/or trans. Since March 2018, I’ve been a resident of Jack Straw Cultural Center’s Artist Assistance Program, recording my next project of music and spoken word poetry called DARK AT DUSK: The Final Suicide. In May, this project will be presented in a 4-night multimedia show of the same title at Gay City Arts. I’ve been super blessed to collaborate with Brian Is Ze, Falon Sierra, Guayaba, Moonyeka, Lourdez Velasco, Son the Rhemic, Queerbigan, Vanna Zaragoza, and Zora Seboulisa on this project. Together, we’re sharing our peoples’ accounts of suicidal ideation, trauma, and resilience. We are sustaining hope and life for our marginalized communities, sharing more than only a suicide hotline as the ultimate solution. Ever since I survived an overdose on Christmas Eve 2016, every birthday that follows feels like that much more of a blessing. I’m so grateful, and I just want to extend that gratitude to the talented artists I’m intimately working with to bring this story – a story disproportionately more experienced by marginalized people – to life. So please consider supporting this birthday fundraiser – all proceeds go to compensating these brilliant, multiply-marginalized artists. If you cannot attend and still want to support, a gofundme page for DARK AT DUSK will go public on January 15 and that link will be in the Facebook event.